I've been taking the tutorials on zbrushworkshops.com over the last week. To walk you through the program they have you build a zombie. I actually bought the program for my BFA project when it was at version 1.5 back in 2004, but back then they were still very concerned about being a 2.5D program, which is cool, but is a very niche market. I think the interests of their customers and the appearance of programs like mudbox really kicked them into gear and over the last 5+ years the program has become a lot more user friendly. They've also been kind enough to update it for free. Over the last few years I've thought of dozens if not hundreds of instances when I would love to use it for a project, but my ignorance kept getting in the way. I've always pulled it out and occasionally played with the program, but never developed any proficiency. The menus and options are quite daunting. There were also a limited number of easy to access and cheap learning resources, that has changed. There are tons of great ones now. 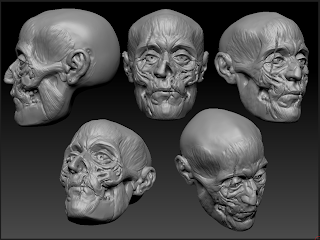 I decided to give Kingslien's zbrushworkshops a try after going through the free ones he provides as an initial sampler. So far it has cleared up a lot of things that have always confused me about the program. The process he walks you through to demonstrate the important features and applications of the program is to build a zombie from scratch. The free tutorials get you through sculpting the head. The remainder have you build the body, clothing, and other accessories. There are additional tutorials on other subjects, such as lightcaps, dynamesh, zspheres, and many others.